There is one thing certain about your monthly expenses and bills: they continue to come, even if your income ceases because of illness. 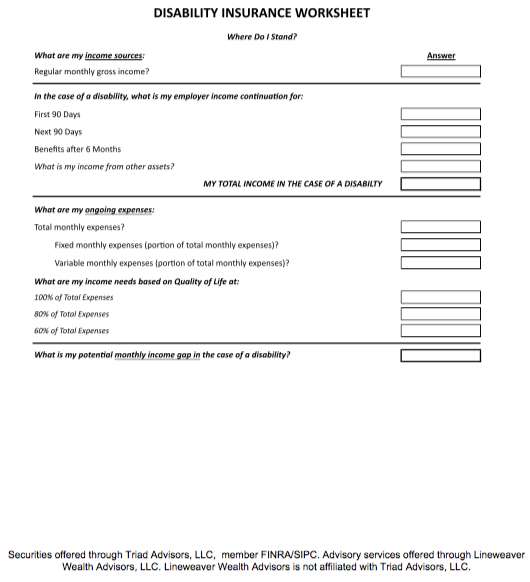 Our Disability Insurance Worksheet may be helpful in determining your current cash flow situation. We also would urge you to call one of the professionals at Lineweaver to make sure you have the right plan for any shortfalls you might uncover. You also need to understand potential reductions in your quality of life during these stressful times.